The Centre for Social Innovation supports faculty in developing and delivering materials for the core management programme that incorporate fundamentals for social innovation. In collaboration with partners in Trinity and abroad, we develop tailored teaching materials. We have a small and growing case collection that includes award winning teaching cases. 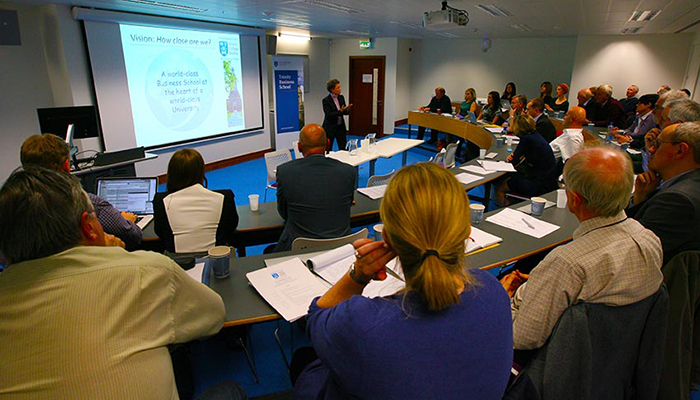 Trinity Business School offers a suite of social innovation and enterprise modules across its undergraduate, postgraduate and post-experience programmes. Final year undergraduate business students in this course have hands-on experience of the practice of social innovation in the Irish context and intensive workshops on current Social Innovation topics. They work in teams with socially innovative organisations, with a focus on optimising the social innovation process and identifying relevant impact measures. Postgraduate International Management students taking this course gain insights into philanthropy and social investment - the use of private funds for public benefit and social change. The emphasis is on the global context of philanthropy and social investment, their implications for international management decision-making, and their roles in catalysing innovation and social change. Our full and part-time MBA students work with social entrepreneurial organisations on project briefs prepared by the partner organisations. At the end of the project period the MBA teams present recommendations for further development. The CSI delivers an annual two day programme for Ideell Arena, the association Swedish third sector leaders. In 2016 Ideell Arena presented the Centre with its annual award for Leadership.